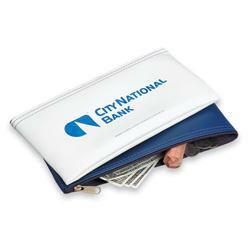 A quality custom bank deposit bag in imitation leather. 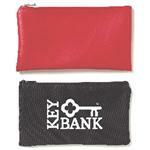 Keep your deposits, or anything else, secure with a heavy duty zipper and durable supported material. Comes in White, Royal Blue, Black, Red, Green, Brown, and Navy. Made in USA! Available Colors: White, Royal Blue, Black, Red, Green, Brown, Navy. Production Times Available: Standard 5 to 7 Business Days. Inquire for rush production. Dimensions: 5 1/2h x 11w. Available Imprint Options: Screen or Pad Print. 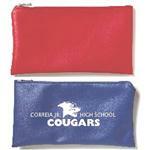 Imitation Leather, zippered bank deposit bag. 16 lbs per 100 pieces.